With the Seattle Public Library’s recent launch of a smart phone app, our fair city is toeing the waters of the next innovation in bringing government closer to the people… the people with unlimited data plans. 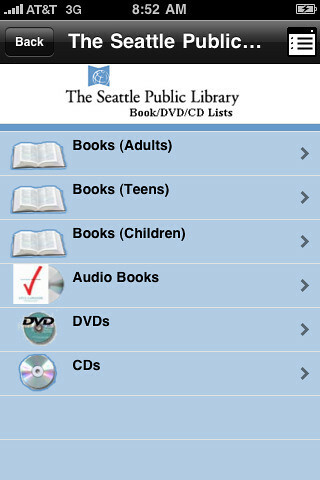 SPL Mobile, which is available for all major smart phone software, allows readers to locate the nearest library branch, reserve books, and even chat with an on-call librarian. The app went live in late-April, and since then it has been downloaded more than 3,000 times. Virtual Services LibrarianToby Thomas considers SPL Mobile an affordable way to potentialy increase library use. “I think it’s gonna give us more bang for the buck, because we’re available in more places,” he said. Internal discussions for the app began about one year ago, he said, after patrons had indicated they were interested in such a tool, and formal planning commenced in early 2010. The total cost to the city was $6,995 in subscription fees, while the development and installation fees were waved. “Knowing we didn’t have a lot of money and not a lot of time, we looked around to see what other apps were out and we found this vendor (Boopsie, Inc.),” Thomas said. Early feedback suggests that the app is faring very well, with four-star ratings for both its iPhone and Android versions and only minor problems reported. SPL Mobile is in part a product of the open data movement, which encourages governmental jurisdictions to share their data with the general public to ultimately encourage a better informed and engaged citizenry. Seattle’s Chief Technology Officer Bill Schrier, who oversees the City’s Department of Information Technology (DoIT), sees enormous potential benefits from making datasets more accessible. The city already makes certain datasets available at data.seattle.gov. “I’m hoping that by putting this data out there transparently we can help people keep themselves safe and improve their quality of life,” Schrier said. He identified neighborhood block watches as one potential beneficiary. By being able to track the location, date, and time of day of incidents of arson or street crime, better informed block watches might be better able to protect themselves and report legitimate suspicious behavior to police. “Arming people with information helps them help themselves and therefore their government in a time of budget restraints,” he said. He envisions a day in the not-too-distant future when citizens can more effectively engage with their government through social networking or other internet tools. Static data, such as the location of a park or the hours of operation at a community center, is easy to report, Schrier said, but being able to accurately report real-time data, such as an up-to-the-minute building permit information, is more of a challenge that he thinks may hold even greater potential for public benefit. And, tech-savvy citizens with access to government data may be empowered to develop apps or other platforms to present information in a way that is accessible to the general public. One local app that utilizes real-time data to the benefit of nearly 30,000 iPhone users and another 10,000 Android users is OneBusAway. The program, which was developed by UW computer science graduate student Brian Ferris and launched in 2008, allows users not only to locate the nearest bus stops and the routes that frequent them but also to see how many minutes away the next bus is. OneBusAway utilizes bus schedule data from King County Metro and a live data feed for tracking buses that was developed at UW more than a decade ago. The program serves more than 20,000 unique users each week, Ferry said, and it receives more traffic than King County’s own bus tracker. King County still does not offer a bus tracking smart phone app. OneBusAway also partners with Sound Transit, Washington State Ferries, and Pierce County. Several other cities have more robust open data programs that have given rise to entrepreneurial web developers. DataSF, for instance, offers more than 30 apps that report on everything in San Francisco from crime, to transportation, to restaurants’ health inspection records. 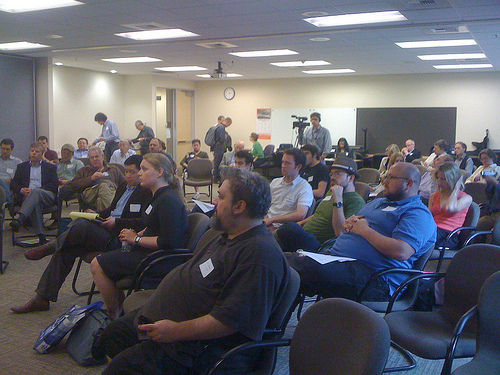 King County’s Open Data Workshop drew a packed house of government officials, web developers, and several self-proclaimed data lovers. Tuesday night, King County hosting an Open Data Workshop, an opportunity for county officials to learn what sorts of datasets local developers would like to see made available and how the County can be more helpful. King County Webmaster Sabra Schneider said, “We had an interesting discussion about data priorities for the public and the challenges we see moving forward. Ideally, we want members of the public to do things with our data that we’ve never thought about.” The areas she said drew the most interest from the public were transit, health, geographic information systems (GIS), and property. Next steps for Schneider include conducting a public survey that builds on the information gathered at the conference, and collaboration with other King County departments to identify promising datasets. Video and notes from the event should be available online by next week, she said. As for that CHS smart phone app you’ve been waiting for? It’s coming soon. Very soon.